We live in a place where there are a lot of transient and homeless people. On street corners and around the downtown plaza, in front of the food co-op and at the weekend farmer's market, there is an ongoing presence of the downtrodden and the disconnected, the broken and the bereft. We always smile and nod. We never look away. We make eye contact. We are compassionate and never judgmental. We sometimes give money, and we always give our quiet acceptance. We live a mile from the town square, so we were surprised the other day to find a man walking down our little street with a pack on his back. Our little neighborhood is not the usual place to find someone in need. But there he was. He was walking east past our house, and we were walking west back to our house from an after-dinner walk. I noticed the words on his tee-shirt. They said Walked Here From Florida. I turned around after a few steps and looked back at him. There was a sign on his pack that said, Walking to Seattle. I just couldn't believe it. Is this true? So I ran after him and asked him, "Did you really walk here all the way from Florida?" He said yes. 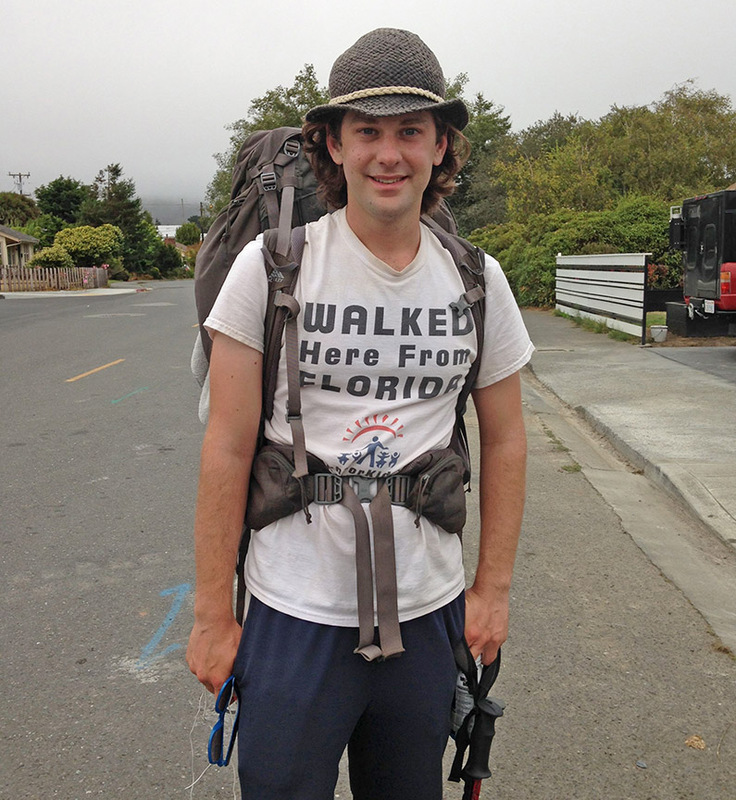 So, here on this little street in Arcata, we met this lovely young man who has been walking since May 2013 to raise money for ekal vidyalaya, an organization that is dedicated to bringing education and village development to rural India. He told us how just a little bit of money helps a lot of children there. He was absolutely committed to helping as many as he could. We asked him if he had a place to stay for the night. He said that he was on his way to his host's house. We asked him if he was going to fly home from Seattle. He said that he really wanted to step a foot into Canada, the way he had in Mexico, so he could say he walked from Florida to California, from Mexico to Canada. Then he wanted to rent a car and drive his walking path home. Stephen Hnilica emanated serene happiness and a hopeful generosity of spirit. I asked him if I could take his picture. He said, "Sure, for five dollars." Uh-oh, I never carry my purse. So, I looked at Roger, "Do you have five dollars?" Stephen laughed, "I'm only kidding with you. Sure, take my picture." So I did with the iPhone. We thanked him. We shook hands. We told him how happy we were to have crossed paths with him. We waved good-bye. We feel so unbelievably glad to have met him, to know a young person whose dream is bigger than himself. It's the best part of giving someone a second look. I saw a video the other day that was shot from the Space Shuttle during take-off. It was pretty interesting watching the accelerating speed and the perspective from space when the roundness of earth came into view. There were scattered clouds and darkness, spheres of light, and endless distance as the shuttle flew faster and faster away. Seeing those clouds, the earth, and light made me think of how small our view is standing on our two feet and looking up, and yet how much it still dazzles us. A month or so ago I saw this photograph of Vadersolstavlan a 1636 reproduction of a 1535 painting. It's called The Sun Dog Painting, depicting halo displays of April 20, 1535 in Stockholm. There's just something about knowing that someone looked up into these beautiful skies and saw halos and sun dogs, and was moved to paint what he saw. I thought about the first 57 years of my life when I saw sunrises, sunsets, and rainbows, but never knew other phenomenon even existed. There must have been arcs and halos, sun dogs and crepuscular rays that just went by unnoticed. I do remember one drive across country seeing some clouds off in the distance, maybe it was in Kansas or Oklahoma, that were brightly and unusually colored. My then-boyfriend Michael D and I remarked on the crazy light green cloud, and wondered how such a thing was possible. It was in those early hippie days when we must have thought just seeing it meant we were special. It was there for us. You know how that is. Now I wonder what it might have been like to have been observant all those years, but not having the internet at my fingertips. What if I did see halos and iridescent clouds, anti-crepuscular rays and circumhorizon arcs, how would I have even begun to research such things in 1965 or 1981? 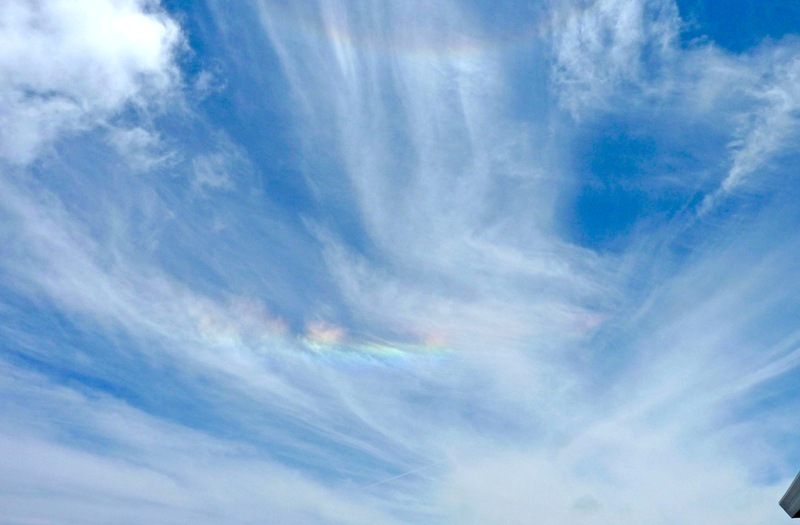 The first rainbow colored cloud I ever photographed was this one (above pic) taken from the beach house in Capitola in 2009. 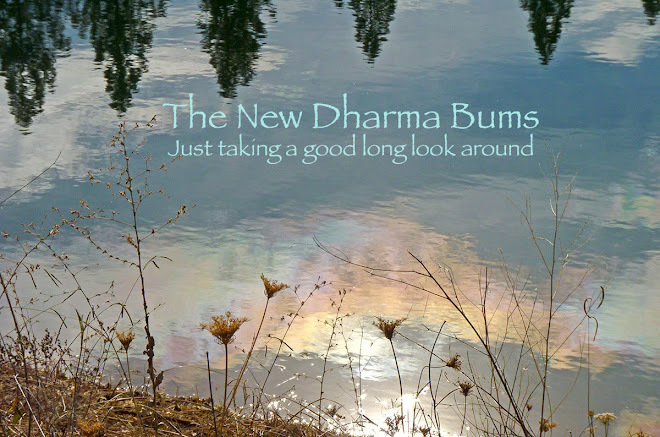 I called it a sun dog, and I have no idea how I came up with that term. It was really a beautiful circumhorizon arc. 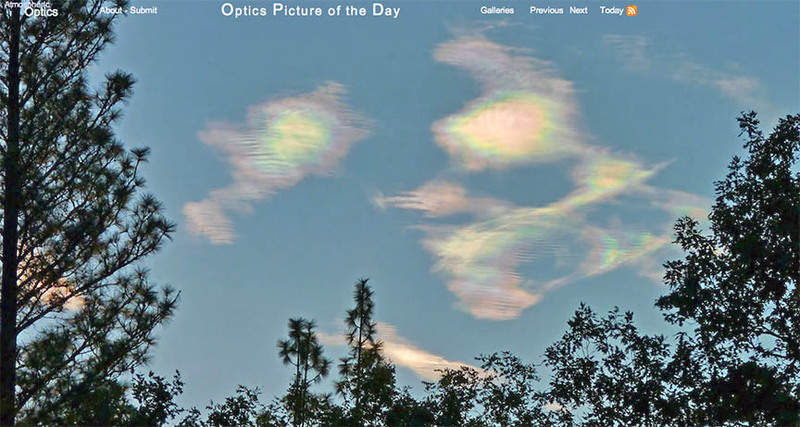 I heard from Les Cowley last month, asking if my iridescent cloud photograph that he published on his website could be used by a professor who was writing a book "Setting Up a Weather Station and Understanding the Weather: A Guide For the Amateur Meteorologist." I said yes, of course! The chapter it will be in is on observations. 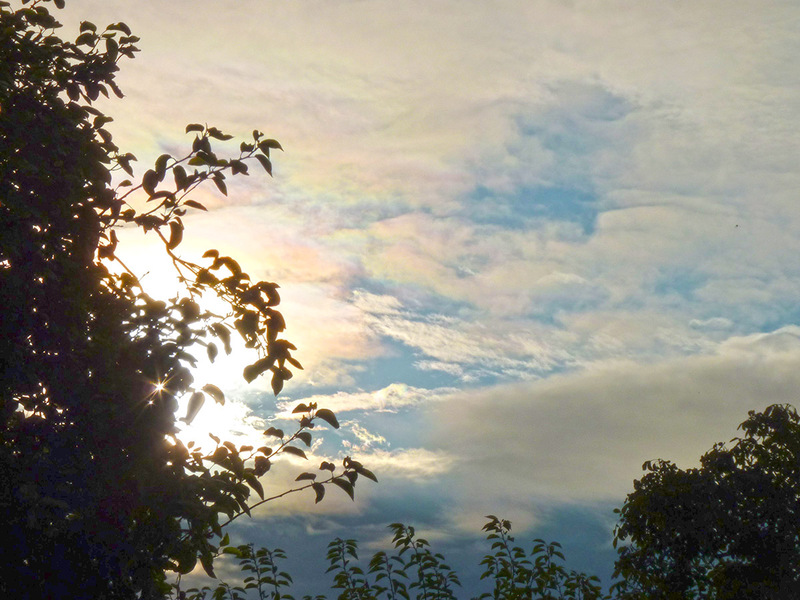 This was the first iridescent cloud I ever photographed. I called it a sun dog too. This is the cloud that made me turn on the computer and research rainbow colored clouds. That's how I found Atmospheric Optics. I wrote Les Cowley, and he kindly responded and answered my questions. What is this crazy cloud formation? Help! Ah yes, the Space Shuttle reminded me. It moves far beyond this chaos of wires and dangling sneakers, where cars and stop signs seem like quaint artifacts of a planet that forgets it's hurtling through space, and where the most spectacular tricks of light can go unnoticed even in our small slice of sky. The Panasonic Lumix FZ35 died on Friday. 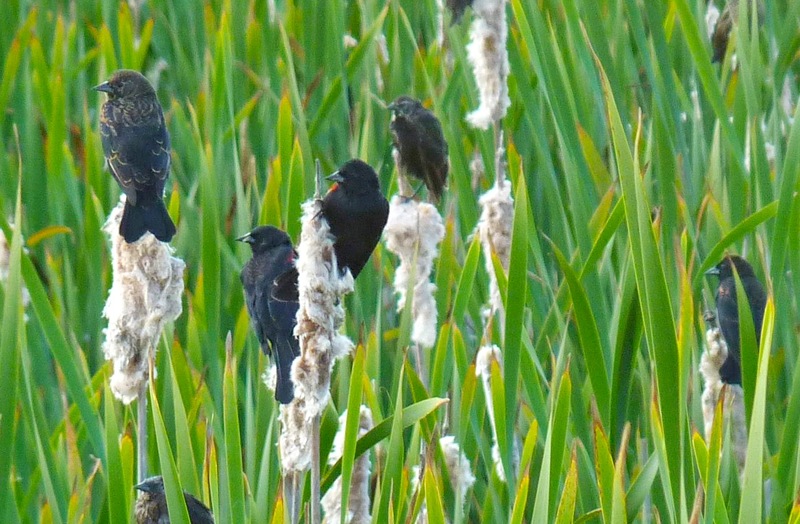 We were out at the marsh walking along watching the sandpipers and willets, the godwits and avocets, when I noticed that the on/off switch on the camera stopped working. The switch was in a constant "on" position and slid easily between the two ends, making no connection at either. When we got home, Roger tried taking it apart, but those cameras have crazy insides like weirdly wired little robots. No hint of what thing does what to which other little thing to make pretty pictures. He couldn't even get to the on/off switch which was behind a shield that had no hint of entry. When he put the tiny, tiny screws back in the camera was dead. I'm surprised I never thought about what kind of new camera to get, even though I had been disappointed with the old camera's ability (or lack thereof) to autofocus on clouds. It hardly ever captured what I saw with my old eyes. I know I'm a lazy bum when it comes to understanding photography. I have learned the names of hundreds of birds and many, many cloud formations, arcs, halos, and atmospheric phenomenon over the years. But no matter how many times I tried to grasp shutter speed and aperture, iso--blahblahblah, it never made any sense to me, and I promptly forgot it every time! So, here I am thinking about buying a new camera and trying to figure out what to get that won't tax my brain, but will show the close-ups and the far-aways with vivid clarity. These are a few of the photos I took over the past week, the last from the old camera. When Roger and I are on the road, we never eat road food. We always pack a lunch to take with us. When we drove from southern California to the beach house, we stopped at Pismo Beach to eat our sandwiches. 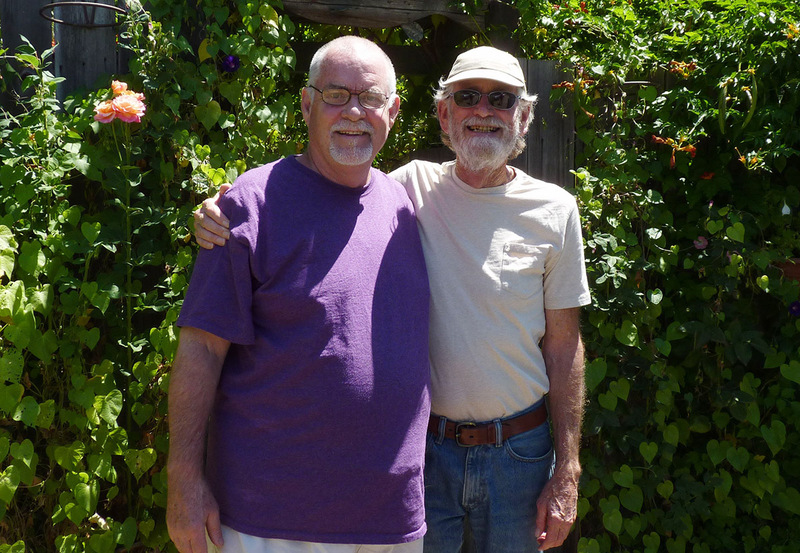 When we drove from the beach house back to Arcata, we made a special stop and had our homemade egg salad sandwiches sitting in the sanctuary garden at our blogger friend's house. "M" lost his loving partner Trace last month, so we stopped by to hug him and take one of the last photos the old camera clicked. We took a long, long drive south to see my mother. It is now a 700 mile (1126 km) journey from our door to hers. We would never do that trip in one day, so we stopped at the beach house for two nights on the way south, and two nights on the way back north. 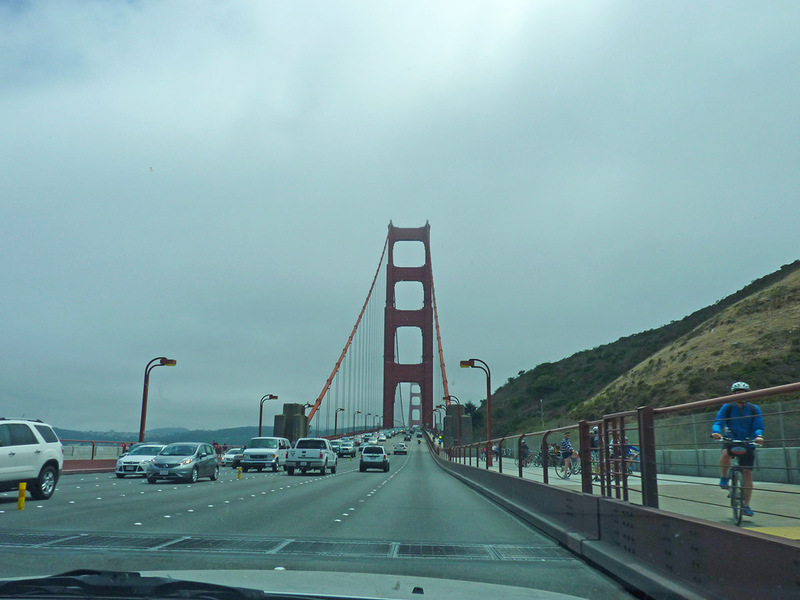 The journey south and north means crossing the Golden Gate Bridge, and for all the many times we've done that it never ceases to inspire awe and joy. 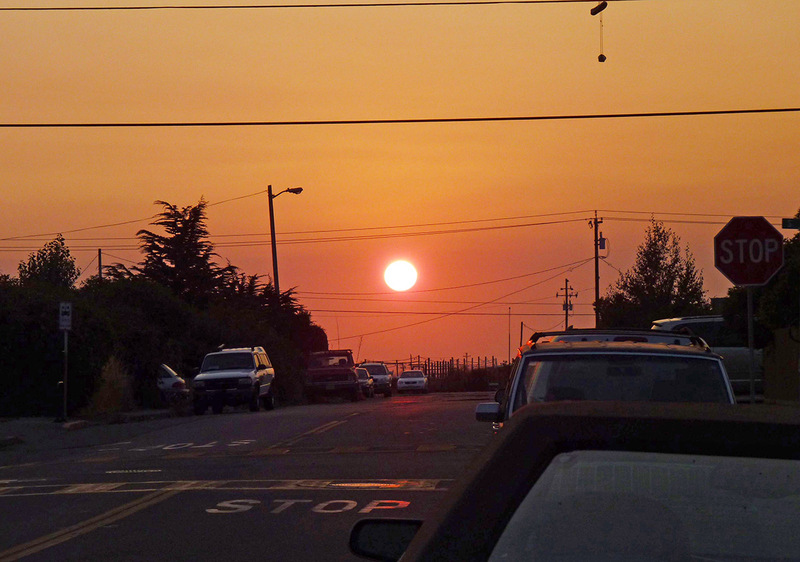 The first two nights in Capitola produced very little in the way of photographic opportunities. 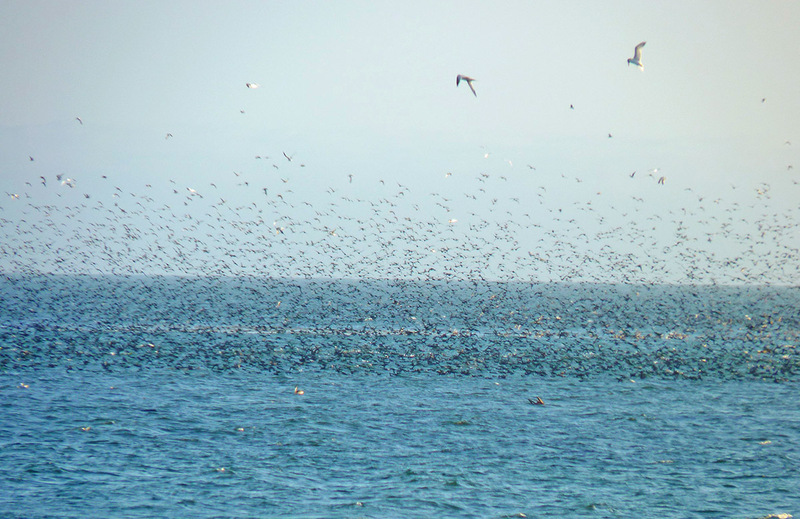 We did see thousands upon thousands of sooty shearwaters going after the millions upon millions of anchovies in Monterey Bay. 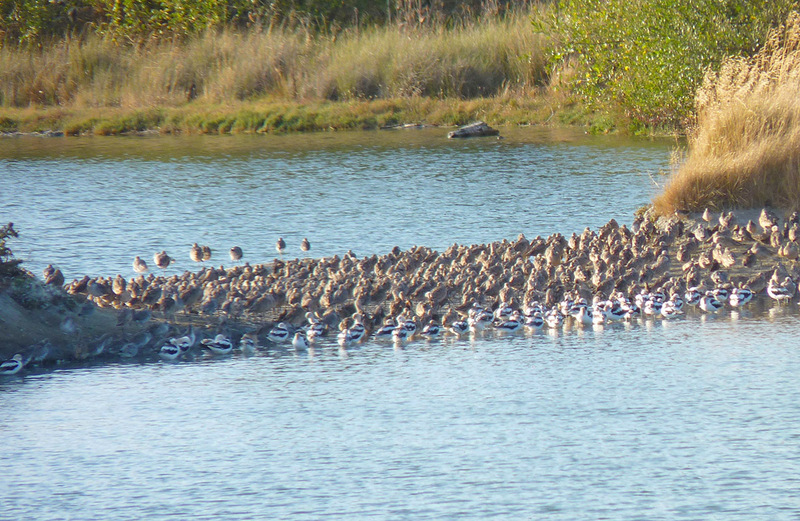 Hard to capture the sheer size and energy of this intense migration and feeding frenzy. This is just a slice of the action with two Caspian Terns up at the top of the pic. We spent five days in southern California. I hardly used the camera at all. I don't know why, there are some lovely dry brushy mountains all around; my mother looked picturesquely beautiful everyday (especially in her yellow shirt, yellow beads, and dangling yellow earrings! ); there was a sunset so awesome that I almost asked Roger to turn the car around so I could photograph a crazy blood orange sun in a deep red purple sky, but I didn't. I was just uninspired and a little road weary. So, there's not much to show for our time there. 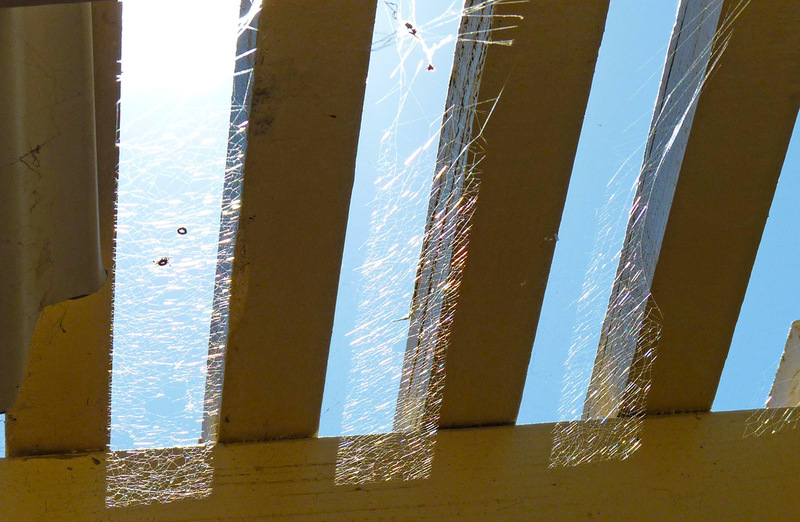 I did see these spider webs gleaming in the light through the wooden slats over my sister's backdoor slider. That's it. On our return-home journey we did see a wonderful sky over the bay with a circumhorizon arc and a 22 degree halo visible together. Did manage to get a shot of that. You know how much we love the splendors of an ephemeral sky. 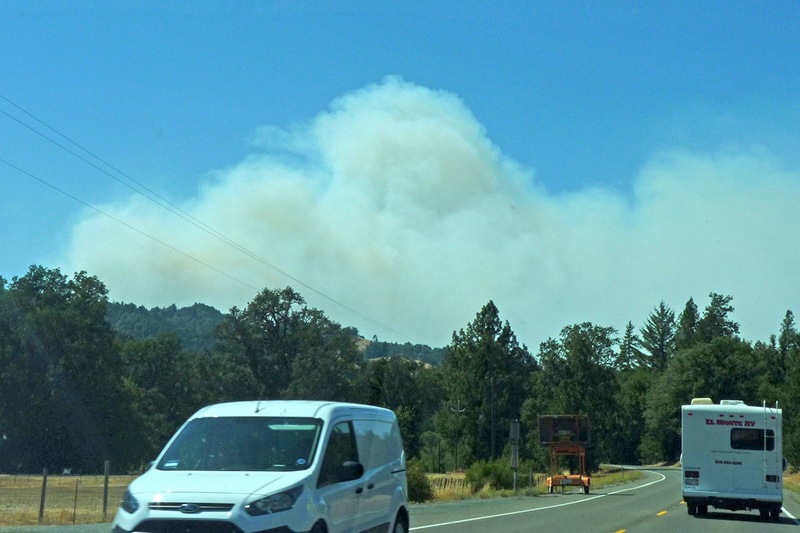 On the way south we noticed some smokiness just north of the town of Laytonville. We knew it was a fire, and checked the CalFire Incident page when we got to the beach. 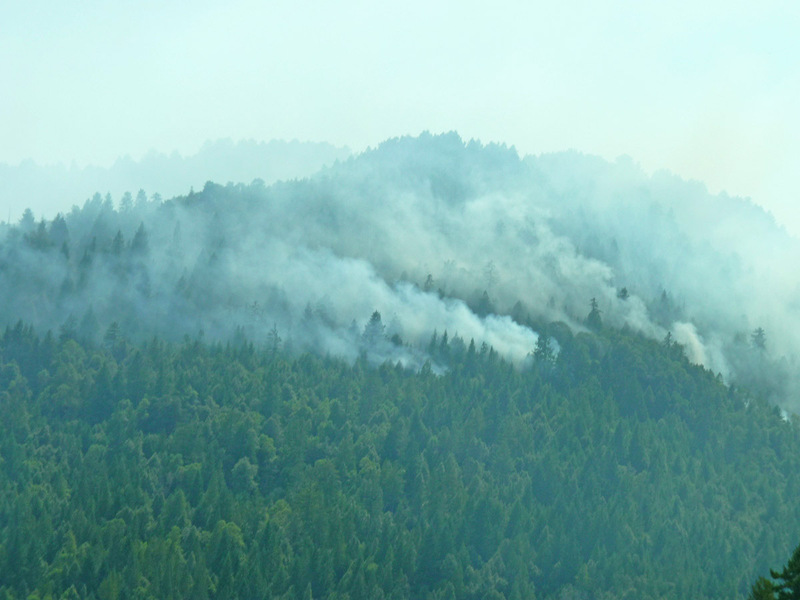 It was the Lodge Complex fire that had started on July 30th by lightning strike. When we drove through on our way south it was 900 acres. On our way north six days later, it had grown to 10,000 acres (and only 40% contained). Here's what it looked like as we headed north. 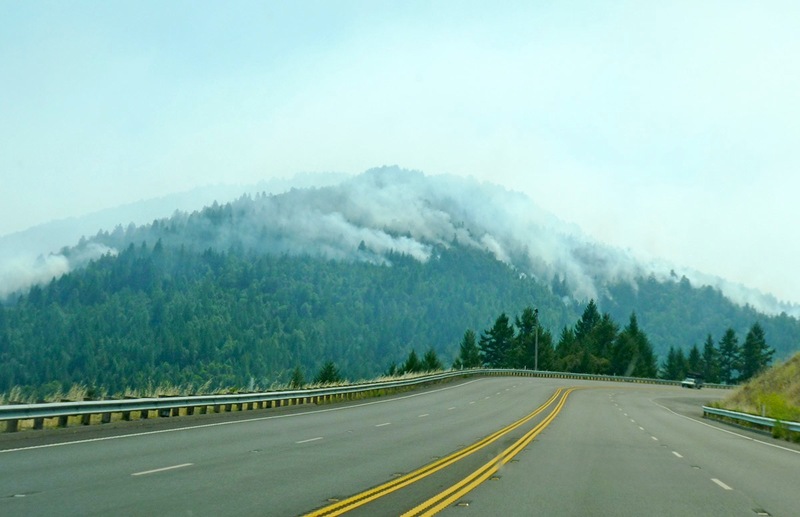 Highway 101 curves and winds its way north through Mendocino County on the way to Humboldt. There is a long curve in one spot where we could see where the fire was burning most intensely. Other drivers had pulled over to photograph the sight. We were on the wrong side of the road for that, but I did manage to get a shot of the smoke as it filtered over the mountain, looking very much like the fog of San Francisco. To know it was smoke this close to the highway was a rather spooky observation. Summer is fire season in California. This is what it looks like. Welcome to our world. We're glad to be home.